Much loved among home cooks, the Instant Pot has become a necessity in many kitchens over the past few years. Convenient and easy-to-use, whipping up delicious meals have never been easier. Often marketed as a seven-in-one appliance, it not only functions as a slow cooker and pressure cooker, but it can also be used to steam, sauté, make yogurt, and more. Considering all that it can do, it’s not surprising to know that it has gained somewhat of a cult following in the recent years. Designed for utmost convenience, the Instant Pot comes with 14 preset smart programs; these include: Bean/Chili, Soup, Meat/Stew, Keep Warm, Porridge, Multigrain, Poultry, Pressure Cook, Slow Cook, Yogurt, Manual, Saute/Simmer, and Rice. To cook your favorite dishes, simply place the ingredients into the pot, and press the appropriate button. What Material is the Inner Pot Made Out Of? The inner cooking pot is made from food-grade stainless steel, with no chemical coating. Not only is the bottom layer three-ply for even distribution of heat, but the fully-sealed environment allows for the aromas, nutrients, and flavors, to be trapped within the food. How Safe is the Instant Pot? What Does the Instant Pot Come With? 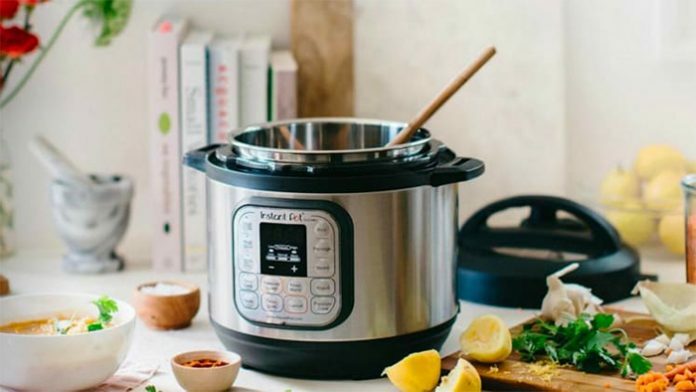 While it comes with everything that you need to get started, many users choose to purchase additional accessories for their Instant Pot. In fact, if you’ve ever researched on the topic, you’ll notice that many people rave about their accessories on blogs and Facebook groups. In fact, there are some things that you can’t simply can’t cook without the use of certain accessories. For example, you’ll need to have some sort of springform pan before you can make a cake with the Instant Pot. Which Instant Pot Accessories Should I Get? “What accessories should I get?” is probably one of the most commonly asked questions among new Instant Pot users. To help you out with your decision, we’ll be going over ten of our favorite accessories below. First off- what is the sealing ring? As its name implies, the small device is used to seal the gap between the inner pot and the lid. A crucial component, it prevents steam from leaking during pressurization. As crucial as they are, however, they tend to absorb odors during the cooking process. Not only that, but the silicone material tends to degrade over time. Considering these points, it’s highly recommended that you purchase a few backups. In fact, it might even be a good idea to use two separate sealing rings for different foods (e.g. savory vs sweet items). Note: For the best results, it’s recommended that you purchase authentic Instant Pot sealing rings (Remember, genuine sealing rings are designed, engineered and built to withstand high-pressure force). Over the past year, more and more third-party sealing rings have shown up on Amazon. In contrast to the real thing, these are not tested or certified by Instant (i.e. safety might be an issue). While the Instant Pot does come with a lid, it’s not designed to let you see the contents of the inner pot (which you might want to do to keep track of the cooking process). For this reason, we highly recommend that you purchase a tempered glass lid. Designed for clear viewing, it especially comes in handy when it comes to slow cooking and sautéing. Available in various sizes, the Instant Pot Tempered Glass Lid can easily be placed into the dishwasher for easy cleaning. Though you only need one stainless steel insert, having more than one will definitely help when it comes to cooking multiple dishes. Just think about it- you’ll be able to cook two different dishes with two different pots, without having to wash anything! Simply swap one out for another and you’re good. Heck, you can even put the leftovers in the fridge without having to worry about freeing up the pot! Sure, the appliance comes with a stainless steel steam rack, but is it efficient? While it might suffice for small items, you’ll probably need something bigger in the long run. Enter the steamer basket- a great investment, it’s just what you need for steaming the perfect vegetables, eggs, potatoes, etc. Compact and easy to store, you can pop it into the dishwasher for easy cleaning. Who wouldn’t want to to be able to cook multiple dishes at the same time? With the stackable pans, you can! Incredibly useful when you need to cook more than one thing, simply place your food items into the different compartments, and place it into the inner pot (this is often referred to as “pot in pot cooking”). Not only is it great for preparing meals, but you can even use it as a method of reheating leftovers! For those who’d like to try their hand at making a cake (cheesecake, anyone?) definitely get a springform cake pan! Not only cakes, but it can also be used for things such as lasagnas, bread, meatloaf, and more. While the outer ring is made out of silicone, the base is glass, which makes it incredibly durable. Are you a fan of soft/hard-boiled eggs? If so, you’ll definitely want to get your hands on an egg steamer rack. Sure, it’s a bit of a one-trick pony, but it does its job well! Save yourself the trouble of cooking eggs on the stovetop with the trivet- simply place the eggs onto the rack, put it into the pot, press the button and you’re good to go. Made from food grade silicone, these mini mitts are fantastic when it comes to moving hot things- such as the inner pot (when regular pot holders are simply too bulky). Flexible, and easy to wear, it comes with a non-stick ridged surface for easy gripping. Cooked too much food? You can easily keep the leftovers by putting a silicone lid onto the pot. From there, you can put the whole thing into the refrigerator- you don’t even need to transfer anything! Have a potluck or party to attend? If so, you can bring your dish directly in the Instant Pot. Don’t worry- the lid is dishwasher safe, so you don’t have to worry about clean up. As you probably already know, the Instant Pot comes with a stainless steel insert. If you’re looking for something that’s non-stick, you might want to consider purchasing the ceramic inner pot. Designed for even and efficient heating, it can also be used in the oven up to 360 Celsius. As always, it’s also dishwasher safe! Where Can I Buy Instant Pot Accessories? First and foremost, many of the above-mentioned accessories can be purchased on Instant Pot’s official website. Of course, you can also find them on Amazon (many of which are available on Prime). Depending on where you live, you might also be able to find accessories for sale at retail stores. For a list of retailers, click here. Next articleAfter WWE Extreme Rules (2018): What’s Next For Raw and SmackDown?